I stole today’s post from my old blog……this was from 2011, but it’s still delicious and a recipe you must try! OH….SOOOOO…..GOOD!! This maybe one of the most delicious risottos I have had in a long time! While risotto is a bit time consuming, the end result is very worth it! After a 14 day cruise and an empty fridge on their return home….my parents came over for dinner and I decided to make this risotto. I got it from my friend, Kelly’s blog, and she originally got it from The Pioneer Woman (a blog that I visit often). Everyone really loved it….My parents, my husband and even my children! If you have a little extra cooking time in your schedule this is a not to miss recipe! 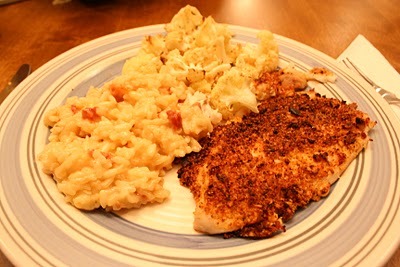 I served this with a parmesan crusted tilapia (recipe coming soon) and roasted cauliflower. Then begin adding broth, one cup at a time, stirring gently while the rice absorbs the liquid each time. Repeat this until the rice is done—it usually takes between 6 and 8 cups of broth. The rice should have a slight bite to it, but not be crunchy at all. Remove from heat, then stir in Parmesan and heavy cream. Adjust salt and pepper to taste.